Vince Romanelli, 2003 Belmont commercial music graduate, appeared on the July 6 episode of ABC’s “The Gong Show.” Hosted by celebrity judges Dana Carvey, Tracee Ellis Ross and Anthony Anderson, “The Gong Show” celebrates talented and unique performers. 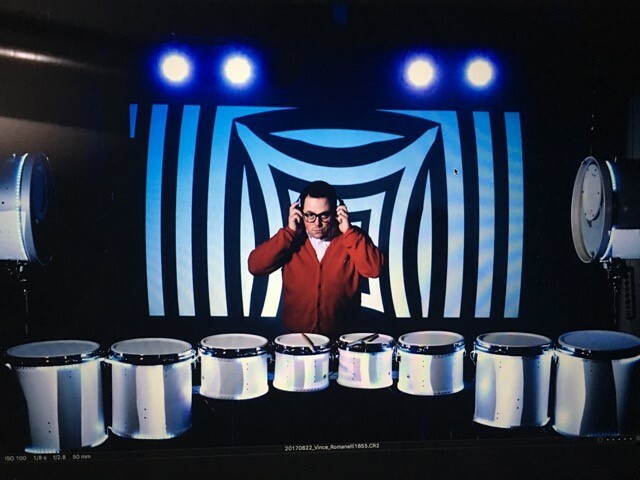 While on the show, Romanelli performed a 90 second video mapped, LED drumming performance where he musically battled his shadow until the duo competed in a video game “death match” with drumsticks. Throughout his career, Romanelli has gone on to start a few drumming groups including a comedy-street drumming show, rePercussion, that he has toured the world with since 1997 and Bucket Ruckus, a group that performs at minor league baseball games. His newest creation and the performance he gave on The Gong Show is djrummer, a one-man, hi-tech interactive DJ drumming show.